To be fully functional, an application must be activated. As the developer, you control what if any features can be used before activaton and the user interface presented by Cloud License. Give the user the ability to view and manage the license from a status screen. As the developer, you control what licensing features are presented to the user. Remotely enable up to 100 unique features in each license based on the customer's Serial Number. Control what data is collected during the activation process using a Serial Number given to the customer at the time of purchase. Information is critical to support, sell and manage the customer experience. 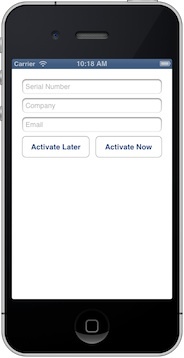 Simplify customer support with Safe Activation. Once activated, your application is controlled by the applied license. Offer your software with Time or Execution Limited Trial, Date Limited, Product, Floating or Subscription licenses to present the perfect user experience and price point for every market opportunity. Inform the user when a Trial license is about to expire. Make it easy to locate the device specific Request Number or purchased Serial Number for product support. With your approval, a Trial license can be reset or extended. 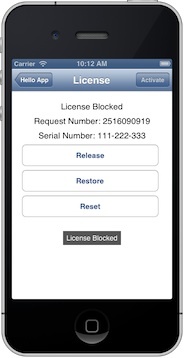 Give the user the ability to securely move a license from one device to another with a simple button tap. Suspend an application if the subscription expires, a license violation occurs or payment is not received.